Glory of God and Country. 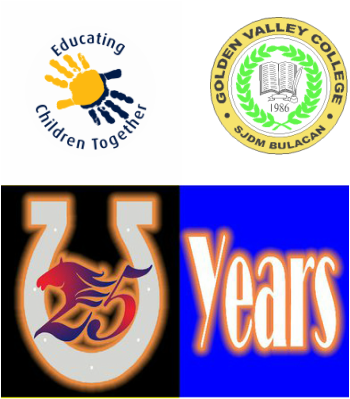 For more that 25 years now Golden Valley College (Formerly Golden Valley Academy) Has fostered Graduates and Indivuduals that have achieved more than they are capable of doing. With Graduates spread all over the world. Golden Valley has kept the excellence and tradition of bringing education to the people who really need it most. 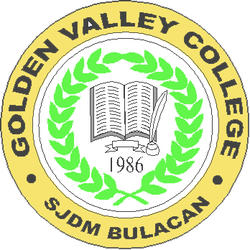 Currently Golden Valley College is serving the community of Bagong Silang a huge village with over 1 million people. Bagong Silang is a relocation site that has bloomed into beacon of hope for alot of Poor Families who can't afford housing. Golden Valley College has been instrumental in producing graduates that have uplifted the standard of living of their families. As a servant of a depressed community of proverty stricken Filipinos. Golden Valley stands a Beacon of Hope for future Leaders and a symbol of excellence for the community it serves. Golden Valley College is also the home of the Thoroughbred the Silent Drill Champions of the Philippines. I wish to extend my warmest congratulations to all the graduates of the Golden Valley and Newland Group of schools. Like a thoroughbred you have been trained to excel in your chosen career. The road to success is not very far. Continue your studies and reach for your star. To the loving parents of our graduates, whose hard earned income goes to educate properly their children, my heartfelt gratitude for entrusting us the education of your child – the most valuable gift. To the dedicated teachers and staff of Golden Valley and Newland, I wish to express my feeling of joy and pleasure for having you as partners in this endeavor. The knowledge and values that our graduates have imbibed in our school will be their valuable asset in meeting the challenges in life. I hope that this yearbook would be a beautiful reminder of your school days in your beloved alma mater. This memorabilia is something to look back in the future as you pursue your goals in life. We owe our success to our Partners the Parents. You are instrumental to your Childrens Future and we are here for you in every step of the way.